Inspired by artisans of the ancient world, Master Jeweler Thomas Sota has captured a sense of Pompeii’s rich history and great artistry with this stunning Sterling Silver ring. 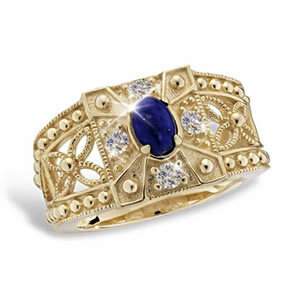 Lavishly coated with 14K Gold and adorned with a Blue Lapis center stone accented with sparkling White Topaz accents, this design features the beaded metal techniques that made Roman jewelry highly desirable. Experience the ancient mysteries of Pompeii as you wear this unique and finely crafted ring.